This has now been re-released as a DVD with more photographs all of a very high quality. This naturally makes it extremely easy to use by playing back through a DVD player attached to a televison. You will get best results from a reasonable sized screen as I did find the captions a little hard to read on our television which is a little elderly. The DVD version of course benefits from the panning and zooming possibilities of moving images although the presentation is still essentially a sequence of still shots. 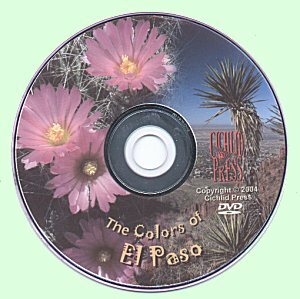 The cacti, wild flower and reptile pictures are identified by common and scientific names but otherwise there is no textual information so this is essentially an entertainment CD. That said, some beautiful specimen cacti have been found and photographed at the peak of their flowering time. Some of the pictures can be made available as windows wallpapers. I tried the CD out on a couple of PCs and did not encounter any problems. The photographers, Gertrud and Ad Konings, are both biologists and live in El Paso. The DVD is available from Cichlid Press and you can find out more information and purchase copies of the DVD from their website cichlidpress.com.